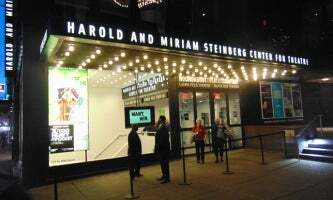 With the generous support of the Steinbergs’ Charitable Trust, the Harold & Miriam Steinberg Center for Theatre opened to the public in March 2004. It would be utilised as the off-Broadway home of the acclaimed Roundabout Theatre Company, whose inaugural production at the venue was the premiere of Lynn Nottage’s Intimate Apparel, which starred Viola Davis. The complex’s main stage is the Laura Pels Theatre with a seating capacity of 424. It was named after the Roundabout board member who previously funded the company’s first off-Broadway home at the Criterion Center. The space originally contained 350 seats, however, during renovation an extra mezzanine level with 74 seats was added in order to accommodate more of the company’s subscribers. The theatre is widely used to produce premieres and revivals by established artists. In 2005, Roundabout completed work on the 62-seat Black Box Theatre in the lowest level of the complex. Besides being used as a rehearsal space and for educational programmes, it is also home to the Roundabout Underground initiative, which launched in 2007 with the aim to produce new works by emerging playwrights. The Roundabout Theatre Company was founded in 1965 by Gene Feist and Elizabeth Owens and aside from the two aforementioned off-Broadway venues, it also owns and operates three Broadway theatres – American Airlines Theatre, Studio 54 and Stephen Sondheim Theatre.